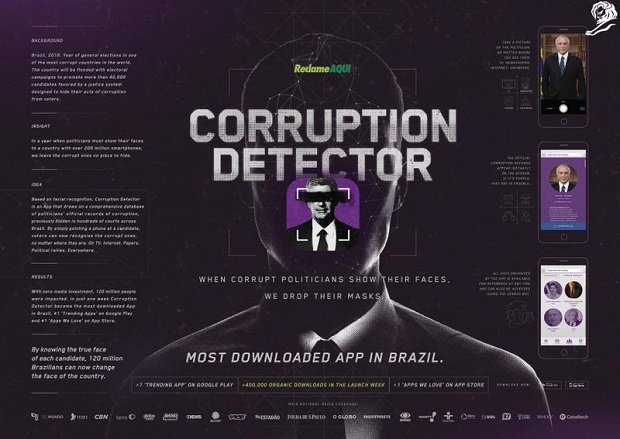 Entries from Digital Intelligence tagged with "south america"
With the World Cup entering its final days, football fever has gripped mobile users worldwide, with Asia and Africa consuming most content on handheld devices, according to new research. Following Samsung’s launch of its first Tizen smartphone, which many have speculated will be targeted squarely at emerging markets, new research from mobile marketing firm Upstream has found that consumers in developing markets are calling for the handset to more readily provide relevant, localised content and services as well as more appropriate payment mechanics and pricing models. The internet is closing in on three billion users, two thirds of which will be from the developing world, according to new research. This chart shows the mobile broadband penetration for each region's population across the globe. North America has the highest percentage of its population using mobile broadband with 72%. Oceania has the second highest percentage with 66%, exceeding Western Europe by 11%. On average, 21% of the worldwide population is using mobile broadband. 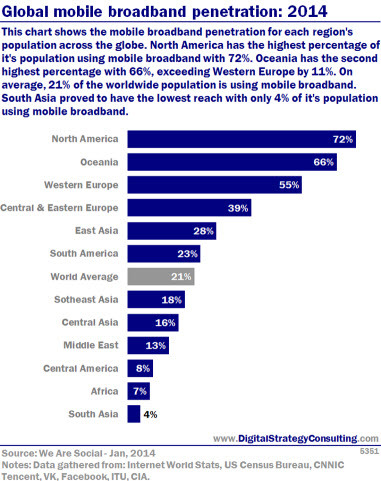 South Asia proved to have the lowest reach with only 4$ of it's population using mobile broadband. 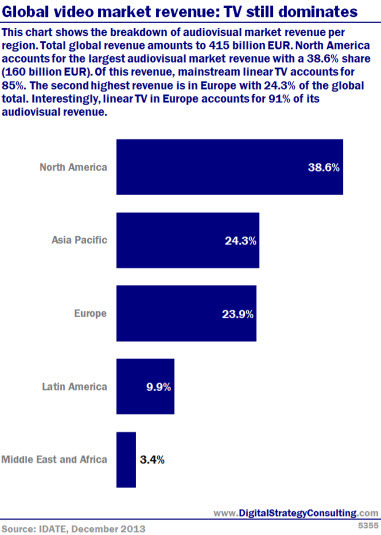 This chart shows the breakdown of audiovisual market revenue per region.Total global revenue amounts to 415 billion EUR. 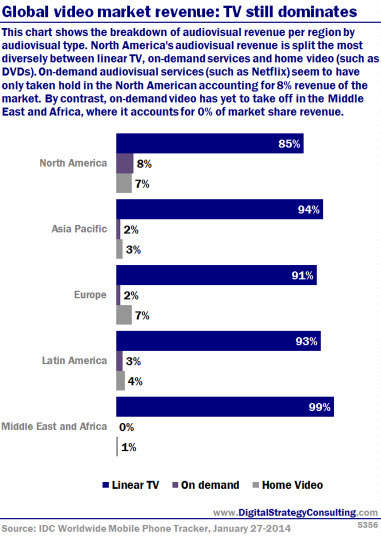 North America accounts for The largest audiovisual market revenue with a 38.6% share (160 billion EUR).01 this revenue, mainstream linearTV accounts for 85%. The second highest revenue is in Europe with 24.3% of the global total. Interestingly, linearTV In Europe accounts for 91% of its audiovisual revenue. This chart shows internet penetration by region. North America and Western Europe have the highest internet penetration out of any region analysed with 81% and 78% of the populations being online. Both North America and Western Europe have double the amount of penetration of the world average (35%). 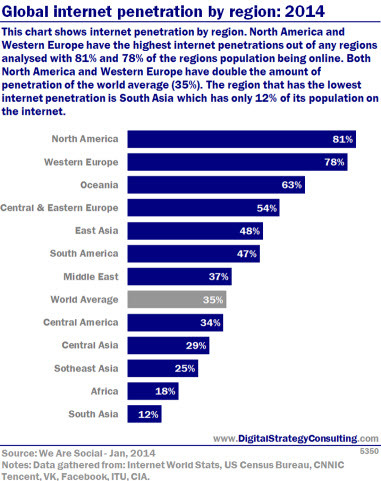 The region that has the lowest internet penetration is South Asia which has only 12% of its population on the internet. This chart shows the top online brands in the US by unique monthly visitors and average time spent for the month. Google received the highest amount of unique visitors for the month, but users spent a relatively low average amount of time on the site at 21 hour and 51 minutes. 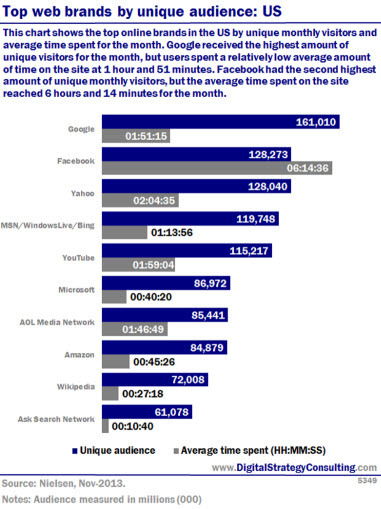 Facebook had the second highest amount of unique monthly visitors, but the average time spent on the site reached 6 hours and 14 minutes for the month. A global survey of application developers and publishers that provides a pulse on the app economy, results showed that developers are creating more apps than ever. The true global scale of digital reach across the globe is hard to measure, but this new slide set from agency We Are Social attempts to create a worldwide snapshot of digital trends in 2014- showing that the North American audience still leads in most areas of web connectivity and access, while Africa lags behind. This shows the consumers who are least loyal to snack brands. Over the period, Europe came out on top as the least loyal to snack brands , with 46% switching brands regularly.The Middle East and Africa stay the most loyal to their snack brands with only 32% of the region straying from their trusted brands. 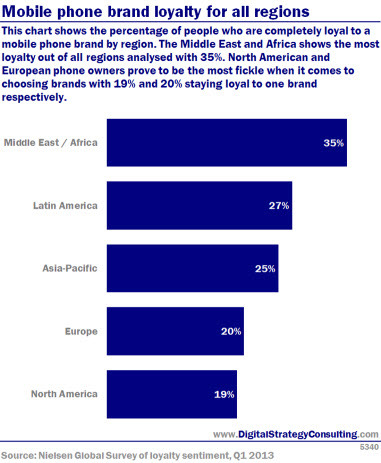 This chart shows the percentage of people who are completely loyal to a mobile phone brand by region. The Middle East and Africa shows the most loyalty out of all regions analysed with 35%. North American and European phone owners prove to be the most fickle when it comes to choosing brands with 19% and 20% staying loyal to one brand respectively. Global loyalty trends: Are loyal customers worth more? How effective are loyalty programs in getting customers to stick with your brand? This research from Nielsen looks at snack and mobile brands across the globe which regions have the most loyal customers. Internet display advertising rose sharply during the second quarter of 2013, rising 27% compared to TV's increase of just 4.2%, according to new research. The amount spent on internet and mobile advertising worldwide is forecast to exceed that spent on newspapers within two years, according to new research. 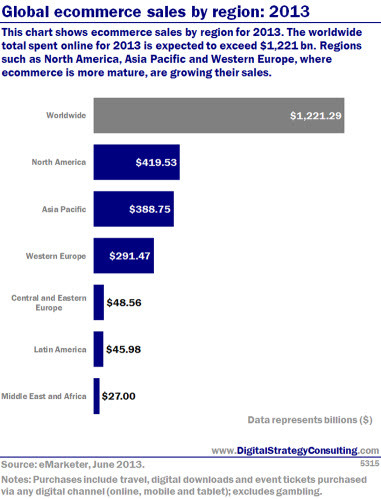 This chart shows ecommerce sales by region for 2013. The worldwide total spent online for 2013 is expected to exceed $1,221bn. Regions such as North America, Asia Pacific and Western Europe, where ecommerce is more mature, are growing their sales.